Just to the east of Skara Brae’s mainland city. History: Ironwood began with the formation of an Alliance between the two guilds: The Black Legion (TBL) and The Order of the Flame (TOF). At that time, the two guilds dedicated themselves to expanding their land ownership, providing strong and competitive commerce, and making sure that any who visited were made to feel welcome. The original vision for Ironwood was one of a group of allied, same-minded guilds; working together to create something bigger than just themselves. The leaders of these guilds, referred to as the Council of Lords, act as a sort of ruling body for the city and its direction. This Council listens to the needs of the citizens and its patrons and makes decisions that are in accordance with Ironwood’s nature and purpose: to create a community where all walks of life may exchange goods, ideas, and a tall tale or two; living peacefully together in an orderly manner. As Ironwood continues to grow and change, it is this Council that will direct the path of our village, ever-mindful of the fact that without constructive criticism and positive change, communities are hard-pressed to provide their citizens and patrons with a sense of pride and worth. So the next time you’re in the area, please stop by and come visit our town, we’re always open for business! At any time of the day it’s common to come to Ironwood and find anybody from a noble Paladin, to our hard-working merchants, or even the occasional lunatic wandering the streets in search of boots. 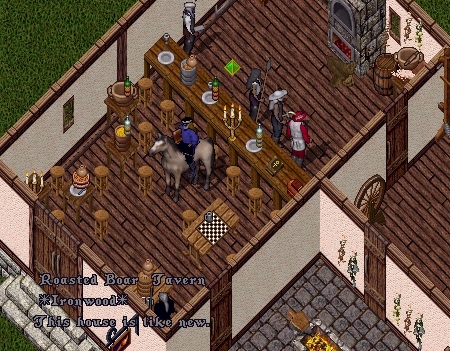 Anyone interested in joining the Village of Ironwood, should make their desires known to one of the Council of Lords via the website link below. Also found at the website are the rules for Ironwood and a list of commerce that can be found there. Ironwood is also a community and role-play center, and we hope to provide an atmosphere and a community of people that you might draw from to assist with your role-play quests and role-play events. 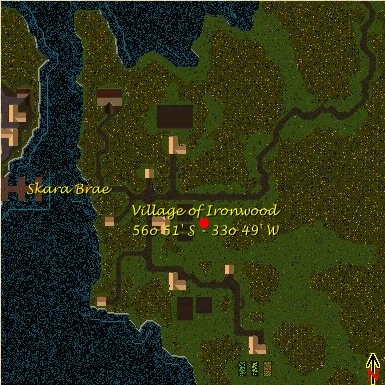 In fact, the entire Village of Ironwood could be seen as a Role-play tool if you wished, we ask only that you somehow manage to contact an Ironwood citizen about the matter. Ironwood also hosts events as they come, but two events of the favorites are the Ironwood Jousts held every Saturday night at 8:30pm pst and the Mining Night held every Monday night at 8:30pm pst.